Motion: This form of waste is whenever there is unnecessary movement of people. Some of the forms this can be seen in are traveling to equipment that is shared with other tasks or looking around for information that could or should be readily available for you. Some common causes of this form of waste are work space layout, ergonomic issues or searching for misplaced items. Waiting: This form of waste is caused when people are stuck waiting for other people, information, products, or equipment which disrupts the process. This waste can look like idle time, customers waiting in long lines, and stopped equipment. It can be caused by the need for an approval or unbalanced workloads. Knowledge: This form of waste is when an individual’s knowledge or skills is not being used to its full potential. This can be seen in a large amount of approvals or reviews, or the neglect of ideas. The common causes of this waste are lack of trust in the workforce and lack of communications between departments. Movement: This form of waste is caused by the unneeded movement of things. This can look like hand carrying equipment and rearranging elements. Some common causes of this waste are too much inventory and a poor layout for the process. Correction: This form or waste is when incorrect or incomplete information has to be corrected or finished when it should have been right to begin with. This can be seen when there are defects, missing information, or dissatisfied customers. Some common causes of this are poor training or communication, lack of in depth instruction, or no standard. 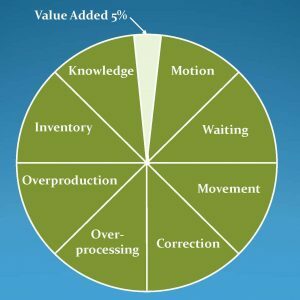 Over-processing: This form of waste is when more is done than what is necessary to produce a product or service. This can be seen in inspections or reviews, redundancies, or approvals. The common causes of this form of waste are an outdated process or a lack of trust or communication. Overproduction: This form of waste is when more is done or made than what was needed. This can look like queues of work or and abundance of inventory. 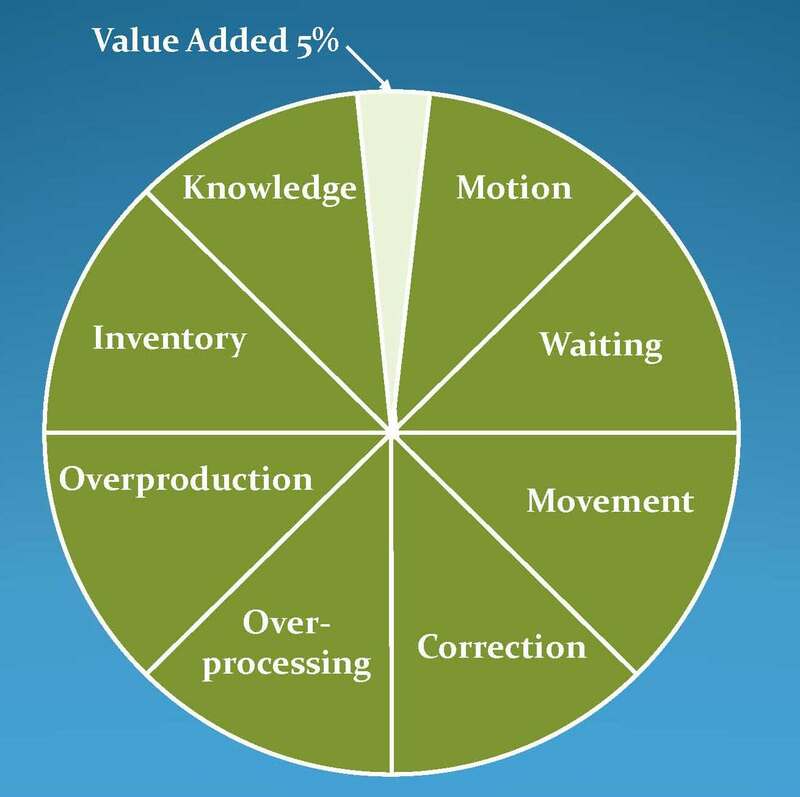 Some common causes of this are an environmental push or a lack of focus on the value stream. Inventory: This waste is the surplus of supplies, information, or equipment. It can be seen as stockpiles of materials, supplies or papers. This form of waste occurs when people make or store items “just-in-case” or when there is an unreliable purchasing process. No matter what the form of waste is, it is always important to know what it is and how to spot it. Lean is driven on the removal of waste in any form to better a process or project so, if you don’t know how to spot it you won’t be able to fix it. Waste is all around us. Look around you now, what waste do you notice just in the room you are in?